March 2015 – Remember; No Matter Where You Go, There You Are! I’m going to risk sounding like a jaded traveler, but here goes…. I really can’t remember how many times I’ve been to Bangkok in the last 32 years, though the first time was December, 1983. The most recent, was yesterday. Bangkok is where we went for teacher conferences when working in Kuala Lumpur, Riyadh, and Abu Dhabi. Bangkok is where my son and I had “that talk” about the birds and bees. It is where Angus and I had suits made, strutting around like the peacocks we were. It is the city I was sure would die under it’s weight of gridlock and pollution and be abandoned as it sank into mud below the river. It was city where my wife caught Typhus. It is where I first learned my father was dying. So I carried a lot of baggage on this journey. Let me first start by saying that the Bangkok of today is amazing. I was not expecting to be impressed, but I was. In 1983, we traveled by tuk tuk, from one neighborhood to another, choking on car exhaust as we crawled along. You can still get stuck in traffic as you can see in my photo above, but some of those vehicles are Priuses, and the taxis and buses are running on natural gas. That is just another day on the road for this Southern California native. There is no longer that gray cloud that used to hang over the roads of Bangkok (and alas still hangs over the roads of Kathmandu). Drivers can also take one of the many elevated toll roads that now criss-cross the city. Linda and I did not need a taxi except for the trip to and from the airport. The rest of the time we used either the elevated “SkyRail” metro system, or the Khlong Boats (canal boats). As it turned out, many of our visits were close to the boat line. There may be times when the canal smells ripe, but not when we were there. The ticket takers move up and down the sides of boat collecting fares. We traveled on boat to Sukhumvit Soi 15, and walked to Cabbages and Condoms. It is a restaurant we went to years ago with Andy’s second grade teacher and other friends. 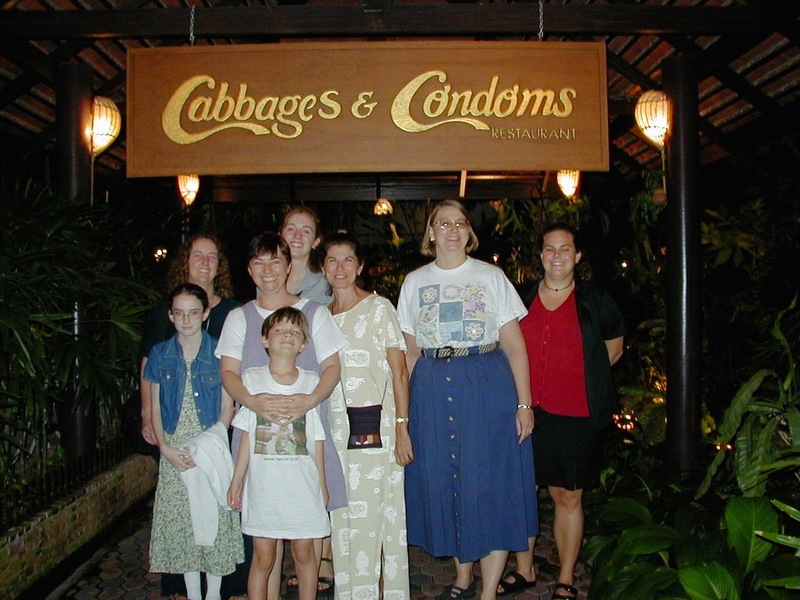 At the time I had a lot of explaining to do with my son regarding the importance of condoms. It is more than just a name at the restaurant, it is a mission. The mission, as the name implies is family planning. The food is delicious. Their sense of humor is infectious. Will you ever look at Santa’s beard the same way? One of journeys on the SkyRail took us to the Weekend Market. But as we were getting off the train we stumbled upon the opening ceremonies of the Muaythai University World Cup. MuayThai, “The art of eight limbs” because just about any pointy part of your body can be used, also known as … Thai Boxing! It was held outdoors beside the National Stadium’s rail stop. We saw the prayers, warm-up, and opening round between Algeria and Iran (the music plays during the round). We know absolutely nothing about the sport, so please disregard our comments! We continued to the Bangkok Weekend Market. It is huge! On a typical weekend 200,000 shopper wander the cramped aisles separating 8000 shops on 30+ acres. As horrible as that sounds, it was still fun! I’m not sure how many bargains were to be had, but it was fun for the photographer. Our friends Susan and John recently moved to Bangkok. At dinner I asked Susan why they chose to live in Bangkok, when they could live anywhere in the world. Her answer: A great public transit system and a surprise each time she leaves her front door. I’ll have to say the same for this visit. It is a place memories are made and I look forward to our next journey to Bangkok. This was not our hotel in Bangkok, we were staying in the nearby Novotel. The picture above though shows a very pleasant lobby with my favorite coffee shop, a ubiquitous sight throughout Bangkok. One of our objectives on this trip was to get thorough physicals. Several of our friends had done that in Bangkok, and I remembered seeing “medical vacations” featured on the American tv news program “The Today Show”. The agent for our insurance provider suggested Bumrungrad International Medical Center. We had no idea what to expect. The name “Bum Run,” along with my unfortunate pronunciation of the neighborhood, “Ploen Chit,” lead to some of my typical poor attempts at humor. We went into the medical center at 8AM and by 11:30 we were having lunch near by. We went to Bumrungrad for the Executive package with 28 various tests, including a cardio stress test for me. This is not our hotel’s lobby, but it is an example of the type of building going on here. 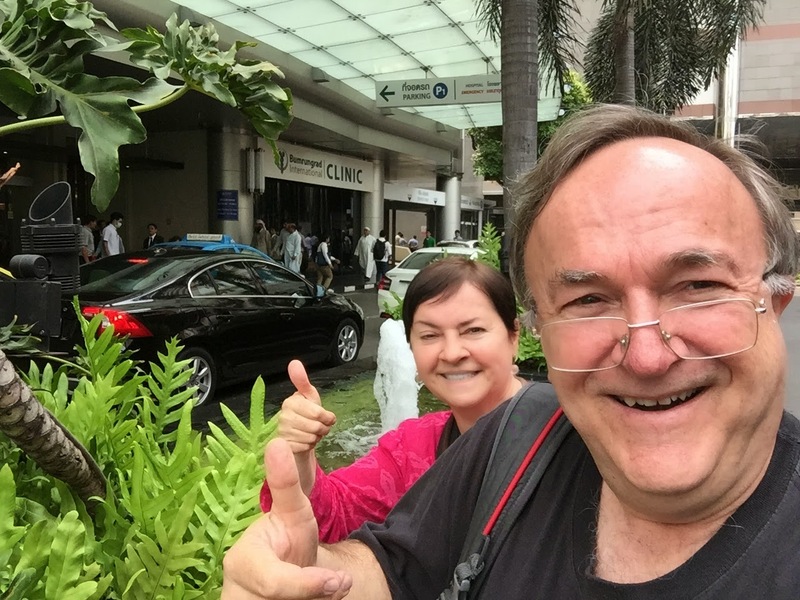 We have been visiting Bangkok since 1983, as a couple, then with our kids, for pleasure, for business, and now back as a couple. It has changed a lot over the years. Large condominium/apartment towers have sprung up round the city, dwarfing the classical single family homes. The vehicle traffic, that use to be dominated by the three wheeled tuk tuk and buses, now compete with new SUVs and luxury sedans. This place seems to be thriving. So if is not our hotel’s lobby, what is it? It’s the Bumrungrad International Medical Center! I was on the Turkish Air red-eye from Istanbul last night, set to arrive in Kathmandu at 6:15 in the morning. A fortunate seating had me with 4 seats to myself at the back, guaranteed sleep and a full day of work the next day. At least in theory! It was the same flight my brother and his wife were on a month before, and the same flight my children were on last December. The sleep part worked great, I was up and ready to go as we approached the airport. Then the first announcement: We were not cleared for landing, we needed to circle for a half hour. That was ok. It was the first flight of the day for the Tribhuvan International Airport, the only airport in the region. My fellow passengers, mostly Germans, gazed out the windows at the Himalayas breaking through the clouds on either side as we circled the valley. At the end of the half hour we descended into the valley, into the clouds. In my mind’s eye, I imagined the descent as it was on clear days, flying through the gap that leads down to the plains of Nepal and the border of India. The foothills that seem to rise up quickly as the jet approaches Kathmandu… but my recollection was interrupted by the roar of the engines and the plane tilted into a sudden steep climb. The voices in the cabin stopped. There was something wrong. We were pushed back into our seats. We popped out of the cloud cover. Nothing gentle about it. We were in a steep climb. “Were the mountains supposed to be so close?” I thought. The pilot calmly said that the runway wasn’t ready. We circled awhile longer. Then the pilot came on again and stated we were going to Dhaka, in Bangladesh, an hour away. Dhaka was clear and we had no problems landing there. The plane parked and was refueled as we waited in the plane. I searched for a wifi signal, but none to be had. What was Linda thinking? Around noon, we took off from Dhaka and headed back to Kathmandu, and without any issues, we were safe, but late, back home. So what does that story have to do with a quiet weekend? The Kathmandu valley is not large, but it is surrounded on three sides by some of the largest mountains in the world. When the large jets leave the airport, they generally do a circle climbing out. The common joke is that if you live in Kathmandu, you live in the flight path of the airport. Last Wednesday morning, the Turkish Air flight tried to make a landing, but there was too much fog. It circled the airport, then tried again. For reasons still to be determined, it missed the center line of the runway and skidded into the grassy (and damp) area between the runway and the taxi way. No one was hurt, but the front landing gear sunk into the mud and the plane blocked the runway. It is still there, 72 hours later. Blocking the only way by air into the valley. Apparently, up to 40 thousand people are affected. Travelers, business people, and workers returning home, or trying to get back to jobs overseas. I feel sorry for them. But here in the valley, it is oddly quiet. Update: As we were departing to Bangkok I saw the Turkish air jet is still here, but in disguise.